Mr. Martinez swears he’s never been sick a day in his life. The 61-year old Produce Manager and former Marine says he’s spent more time over the years worrying about his wife’s health than his own. The fateful day Mr. Martinez did finally experience what it was like to have a health issue; it was, of course, a very serious one. Mr. & Mrs. Martinez have been married for over 40 years. It all started on Veteran’s Day last year. 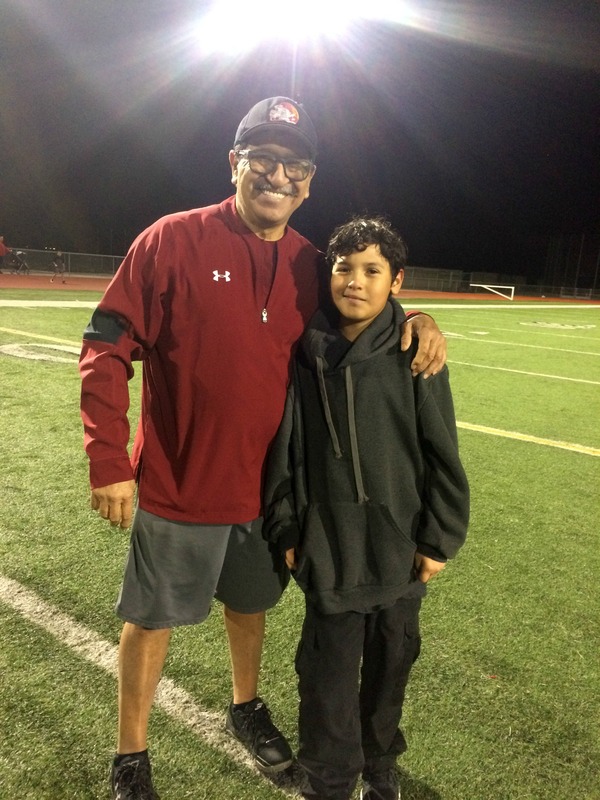 Mr. Martinez coaches high school football in his free time, a hobby that has turned into a bit of a family affair. His grandson Angel has also gotten involved with the sport, serving as the ball boy for his grandfather’s team. This particular afternoon, the pair were at a playoff game in Big Bear, California, when Mr. Martinez began to feel ill. While the search for aspirin was on, that same assistant coach spotted paramedics across the field and ran over to alert them of Mr. Martinez’s condition. Within minutes, they had determined something was seriously wrong with his heart and he was on his way to the hospital. When he arrived at Bear Valley Community hospital, a team of clinicians immediately began running tests to determine what was going on. 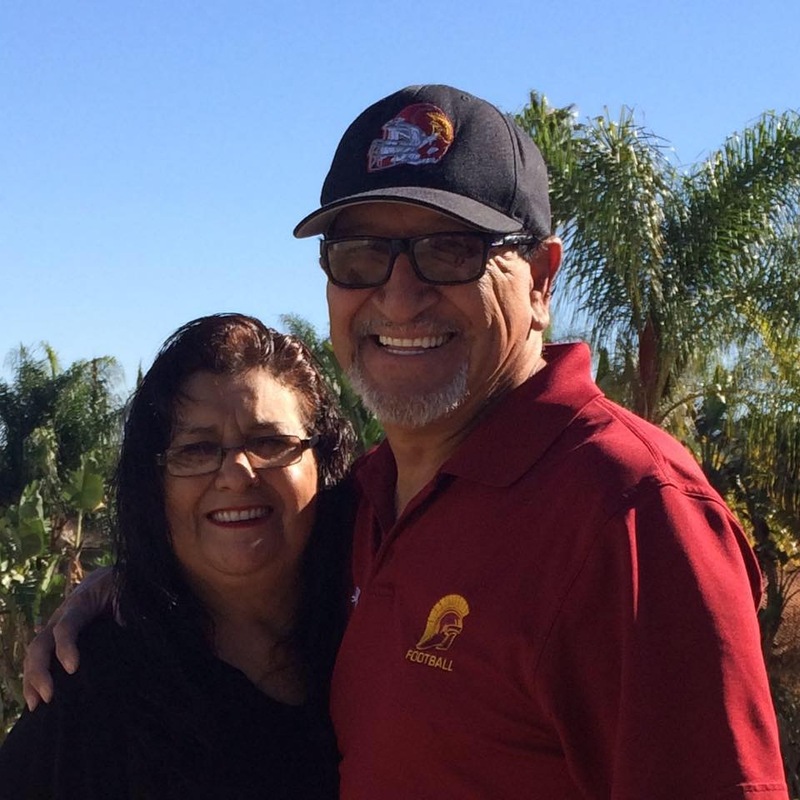 Somewhere along the way, while his doctors were chasing down answers and trying to determine the best course of treatment, the decision was made to transport Mr. Martinez to Moreno Valley for further testing at Kaiser Hospital. However, due to the instability of his heart rate and his incredibly high blood pressure, Mr. Martinez would not be traveling by ground ambulance, but instead by helicopter. What would have been nearly a 2-hour road trip was now estimated at just 15 minutes by air. The hospital contacted REACH 13/H165 in Upland, California to take the transport. On duty that day was Pilot Bruce Malarky, Flight Paramedic Chris Askew, and Flight Nurse Melanie Munns. Mr. Martinez and his grandson Angel. When the crew safely touched down on the helipad, Chris and Melanie unloaded their gear and headed inside to prepare Mr. Martinez for transport while Bruce finished some important charting in the aircraft. As he completed his paperwork, three people caught Bruce’s eye at the edge of the helipad. A father and two young kids; unbeknownst to Bruce it was Mr. Martinez’s son and his two grandkids. In a display of true character, Bruce approached the trio and asked if the kids would like to come over and sit inside the helicopter. Being a father himself, Bruce has a self-admitted soft spot for kids. “Anytime I see kids near the helipad I have to go over and talk to them because for them, what we do is a pretty big deal,” said Bruce. As he began giving Angel and his younger sister a tour of the aircraft, it was revealed that their grandfather was who he would be flying that day. Sensing a bit of nervousness from Angel, Bruce did his very best to reassure him. “I told him that we were going to do whatever it took to get his grandpa to where he needed to be,” said Bruce. In an instant, it was as if a weight had been lifted from Angel’s shoulders. Soon Melanie and Chris were back out on the helipad, this time with Mr. Martinez and the rest of the family in tow. During the flight, Chris and Melanie kept a close eye on Mr. Martinez’s vitals and made good conversation as they headed for March Air Force Base where they would rendezvous with a ground ambulance that would complete the last leg of the trip. The remainder of the journey was quick. After arriving safely at March Air Force Base, Mr. Martinez was loaded into the back of a waiting ambulance and driven just 4 miles to Kaiser Moreno Valley. There, Melanie and Chris waited with him until his new team of clinicians had him settled safely in a room. Mr. Martinez spent a week in the Intensive Care Unit. He was transferred to several other hospitals for testing; numerous surgeries were also discussed as potential treatment options. However, after meeting with a new cardiologist, it was determined that medication and close monitoring of his blood pressure and his heart rate would be the best course of treatment. Mr. Martinez is happy to report that he is now home from the hospital and preparing for retirement. His first bought with illness and his first helicopter ride since his discharge from the Marine Corps, definitely had lasting effects on him and his family, though.